and thinking to achieve desired outcomes. However these subjects are given minimal consideration, if any at all, during a child’s development. This lack of early stage exposure to these concepts can lead us into an adulthood which may be unhappy, unfulfilled, and potentially depressing and damaging. 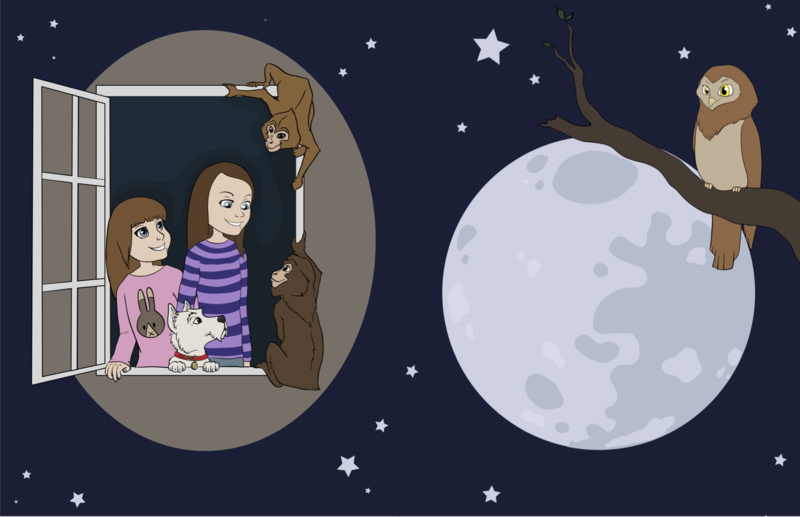 Tales of the Stone Monkey, a series of children’s stories, creates an exciting world, in which our heroines, Gemma and Emma, their pet dog Winston the Westie, and two magical stone monkeys have all manner of exciting, and sometimes dangerous, adventures. These adventures introduce, and then build over time, the three concepts mentioned above, bringing in new characters along the way. Having exciting adventures is just one aspect or mechanism used to convey concepts. Humour and everyday, often mundane, situations are used extensively to underline the importance of these concepts, no matter what the circumstances. I felt it important to anchor the message back into everyday life. Each concept in its own right is incredibly deep, and has, and continues to have, many years of research devoted to it. With that in mind the stories look to blend all three concepts, with self-esteem being more prevalent. Tales of the Stone Monkey – Connections, is the first in the series. As well as introducing the characters, it sets out the importance of self-esteem and looks at how finished self-esteem originates. The concept of everything being connected is introduced, along with the benefit of controlled thinking to achieve a desired outcome. Of course, the connections between the main characters are also made. Connections is the door into a new world. Stories of humour, insight and courage to help children (and parents) develop higher self-esteem, understand the interconnectedness of life and realise the importance of visualising an outcome, and then thinking in the right way, to achieve the desired results.